How do I ReWire Ableton Live with n-Track? Using Ableton Live, you can integrate audio loops and samples into your n-Track projects. This is done by ReWiring Ableton Live 2 or later with n-Track. Install Ableton Live on your computer. If you have not used Ableton Live yet, please launch Live so that it can install its ReWire engine in your system. 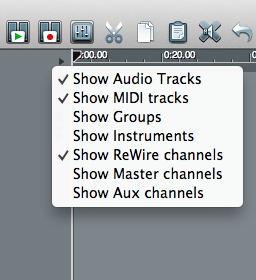 Go to the n-Track "Add Channel" menu, select "Add RewireDevice" menu, and select "Ableton Live". Activate the ReWire channels in the n-Track ReWire menu. To show ReWire Channel in n-Track timeline, select the arrow on top left corner of the n-Track timeline and check "Show Rewire channels". Launch Ableton Live outside n-Track. 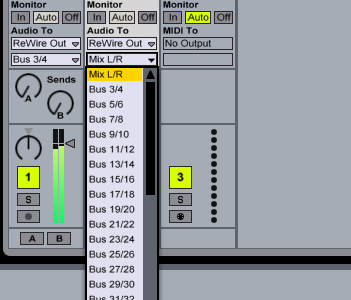 Select the desired ReWire bus in Ableton Live's output menu. 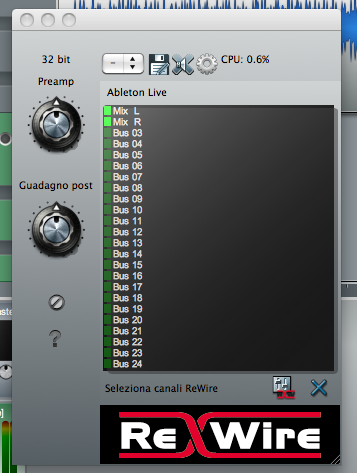 Ableton Live is now in ReWire Slave mode; n-Track is the ReWire Master. To disconnect the ReWire connection you must always quit Ableton Live first.